Perjury, making false statements, and obstruction of justice are crimes that can put a person behind bars. A person who lies about a crime can also be charged with crimes. There are laws that can be enforced if a person lies about a crime. The law criminalizes telling such lies when a person willfully and knowingly lies about facts or details of a crime. It’s against the law to lie to law enforcement officers, public officials, and courts about a crime. 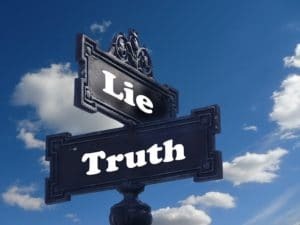 Laws that relate to lying pertain to perjury, false statements, and obstruction of justice which can interfere with criminal investigations and the apprehension of criminal suspects. American law is aggressive in criminalizing lying about a crime, because serious consequences for lying encourage people to tell the truth. Many people realize that committing perjury, lying under oath, is a crime, but they don’t often realize that lying or making false or misleading statements to police about a crime is also a crime. Lying to the police about a friend’s crime can lead to charges of obstruction of justice. Assisting a friend after he/she has committed a crime, then lying to police about it, or helping that friend avoid arrest can result in a charge of accessory after the fact. Intentionally lying about a crime is a serious offense that can land a person in jail. Perjury is perhaps the most recognizable law against lying. Perjury is a federal crime punishable by up to five years in prison. Perjury laws make it a crime to willfully lie while under oath or affirmation. For example, when a person testifies in a trial, he/she is required to swear or affirm that his/her testimony will be truthful. If a person lies about something while on the stand, he/she can be charged with perjury. When dealing with the police in a criminal investigation, a person is not under oath, so they can’t be charged with perjury if they lie. However, they can be charged with other crimes of making false statements or obstruction of justice. Perjury charges also pertain to written statements made under penalty of perjury, as well as statements made in federal courts and congressional hearings. Making false statements is the broadest federal statute that makes lying a crime. Making false statements is a federal offense punishable by up to five years in prison. Laws that define false statements address criminal charges for anyone who willfully and knowingly makes false, fraudulent, or fictitious statements in any matter within the jurisdiction of the executive, legislative, or judicial branch of the federal government. Such statements do not have to be made under oath. The laws related to making false statements date back to 1863 and were initially established to protect the government from claims by service members. In 1996, laws were revised to explicitly apply to any matter within the jurisdiction of the executive, legislative, or judicial branch. Because laws on making false statements don’t require statements to be made under oath, it’s easier to be charged with a crime. Intentional lies and misrepresentations made to police officers or government officials during an investigation can easily lead to criminal charges. Obstruction of justice can be charged against any person who obstructs, impedes, or endeavors to influence, obstruct, or impede the due and proper administration of the law. Federal obstruction of justice is punishable by up to five years in prison. Attempting to interfere in a police investigation, federal investigation, or court trial can lead to obstruction of justice charges. Obstruction of justice charges commonly link to charges for perjury and making false statements. For example, impeding a criminal investigation can happen by a witness making false statements or lying about the facts of a case while under oath. In such cases, a person can be charged with obstruction of justice, making false statements, and perjury, resulting in serious jail time. There are numerous reasons to criminalize lying about a crime. It interferes with police investigations, wastes valuable time and resources, produces incorrect findings, and lets criminal offenders walk free. In many criminal cases, police officers and federal agents have information ahead of an investigative interview with a person but don’t disclose it. This helps investigators to determine whether the person being interviewed is a witness or a suspect. Laws on lying allow charges for lying under oath (perjury), making false statements, and obstruction of justice. In a criminal investigation, a person can be charged for these crimes, even when the investigating agencies can’t prove the crime, or even when it turns out that there was no crime at all. Lying about a crime is never in a person’s best interest unless they don’t care about going to jail.